We benchmarked the Core 2 QX9650 on an Asus Maximus II Gene motherboard with an Intel P45 chipset that supports DDR 2 Ram. 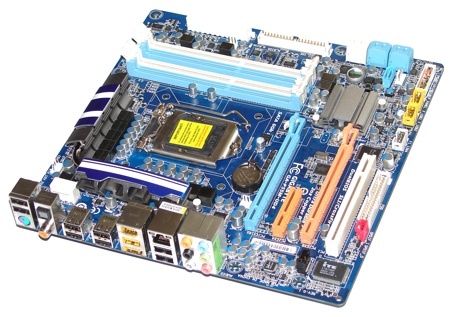 We combined the Core i7 940 with an EVGA X58 SLI mobo which has an Intel X58 chipset and which uses DDR 3. In all three cases, we adjusted the memory multiplier to keep the speed close to 1066MHz so the memory shouldn’t be a factor in our tests. Other hardware consists of an Intel X25-M SSD and a AMD ATI Radeon HD 4890 graphics card. We used 32-bit Windows Vista Ultimate Edition. We’d love to be able to give you chapter and verse on our test results but that’s not possible, thanks to the NDA. However, the graphs should make the following points clear. At standard clock speed, the QX9650 sets a decent standard but it was beaten in most of the benchmarks by the i7 940. The i7 870 takes things a step further and trounced the i7 940 in every test, presumably thanks to the enhanced Turbo Boost and despite the reduced memory bandwidth. More impressively, this extra performance is delivered with a power draw that is 40W less than the i7 940 consumes. The comparison at standard clock speed was fairly straightforward but things took a turn for the complicated when we started overclocking. The first candidate was QX9650 where we disabled SpeedStep, increased the CPU core voltage by 0.2V and cranked up the frontside bus from 333MHz to 420MHz to give a clock speed of 3.78GHz. Next we moved on to Core i7 940. Again, we disabled SpeedStep and increased the QPI voltage by a hefty percentage from 1.1V to 1.5V. With that done, we could raise the base clock from 133MHz to 160MHz to give a clock speed of 3.53GHz. That’s fairly unimpressive as we have regularly achieved clock speeds of 3.8GHz and 3.9GHz with the i7 920. 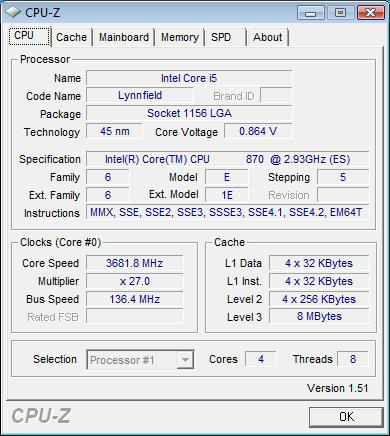 Our 3.53GHz Core i7 had performance that was almost identical to the 3.78GHz QX9650 with the exception of DivX 7 recoding as Core i7 supports SSE 4.2 which gives it an advantage over the Core 2's SSE 4.0.